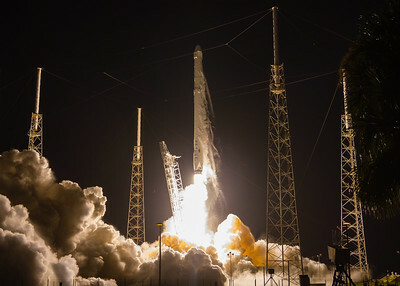 Photos from the July 17 and 18, 2016 Falcon9 CRS9 launch of a dragon capsule by SpaceX to resupply the International Space Station. The CRS9 rocket, seen here about 6 hours before launch (and landing!). Notice the people at the bootom of the rocket (for scale) and also you'll see that a water feature (sound supression, most likely) is being tested near the base of the rockets and the engines. Riding to Launch Complex 40 to set up remotes, we noticed that the #CRS9 #Falcon9 SpaceX rocket wasn't upright. As were were fretting a bit over how to focus the remotes (with no rocket, it would be a bit of an educated guess), we stopped short of the turn to the pad and were treated to a real treat: the rocket was being lifted to a vertical position. 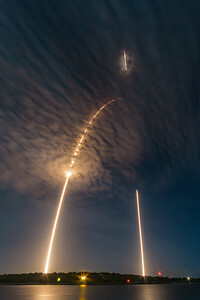 This is a single, 483 second exposure of the Falcon9 CRS9 rocket, launched (and landed!) at 12:45a on July 18, 2016 from CCAFS by Elon Musk and SpaceX. 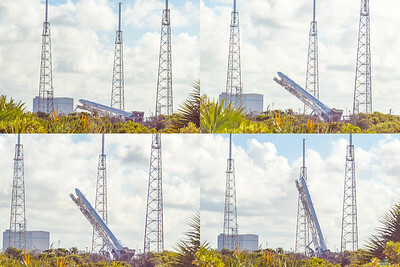 The streak to the left is the launch streak and then the straight line to the right shows the landing of the first stage of the Falcon9 rocket approximately 9 minutes after launch. Most launch and landing streaks are a composite; this is a single image. 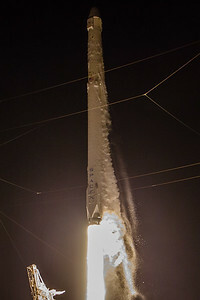 Also, people ask why the clouds don't appear to have moved in the image, and the answer is simple: it's 12:45 in the morning, so with the exception of the moment that the rocket is passing through them, the clouds are not visible; it's night and therefore the sky is dark (the aperture setting is f22).